THE FIRST ‘NEW-LOOK’ regulated Smithfield Horse Fair is due to take place on Sunday. Dublin City Council is to hold the new-look fair from 9am to 1.30pm on Sunday 3 March, and this is the first horse fair to be held under new byelaws adopted by the council this January. The fair will now take place twice a year, on the first Sundays in March and September, as was announced back in September 2012. The changes to the fair came following an incident in March 2011 during which shots were fired at the event, while a teenager was injured with a slash hook. The following month saw three separate arrests when attendees tried to steal a horse. Enterprise minister Richard Bruton had made a detailed submission to the Attorney General seeking advice on whether it was legally permissible to shut the fair permanently, but it was reported that this would be an unconstitutional breach of traders’ commercial rights unless an alternative location was first provided. This will be the first time that Smithfield Horse Fair is regulated. Dublin City Council believes that the new bye laws will improve the welfare of horses attending the fair and the experience of attending the fair for the public. We have worked with Smithfield horse owners, DSPCA and elected representatives to ensure this and hope to see the fair become part of Dublin’s exciting programme of events. Under the new byelaws a Casual Trading Licence is required for each horse attending the fair. In addition to the traditional display of horses, Dublin City Council’s Arts Office and Libraries Service are planning music, an exhibition on the history of Smithfield and a screening of photographs explaining the historical significance of the Smithfield area during the event. Email “First 'new-look' regulated Smithfield Horse Fair on Sunday”. 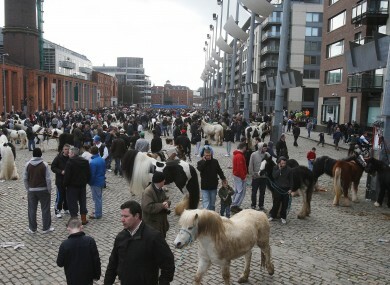 Feedback on “First 'new-look' regulated Smithfield Horse Fair on Sunday”.